GODAN invites you to join the GODAN Action Webinar on Capacity Development - Introducing GODAN Action on Jun 27, 2017 4:00 PM CEST (3 pm UK time). Please register for the webinar here. As the world’s population grows, global demand for food is predicted to nearly double. The number of people at risk of hunger in the developing world is estimated to grow to more than a billion people by 2050. New data-driven solutions in agriculture and nutrition are increasingly being seen as a way to tackle this challenge. The Global Open Data for Agriculture and Nutrition (GODAN) initiative seeks to support global efforts to make agricultural and nutritionally relevant data available, accessible, and usable worldwide. The initiative focuses on building high-level policy support for open data in public, private, and not-for-profit sectors. is a programme launched by the UK’s Department of International Development. It brings together agriculture and nutrition specialists and open data experts and will support GODAN by building people’s capacity to engage with open data. The project aims to contribute to increased farmers’ yields, improved nutrition for consumers and better evidence based policy making. Achieving such impacts requires that individuals, organisations and communities feel confident in engaging with open data. Standards - Enhancing data standards and promoting best practice in agriculture and nutrition to improve interoperability. Research - Identifying and improving tools and methods for impact evaluation of open data usage in initiatives and investments in agriculture and nutrition. Capacity - Building the capacity and diversity of open data users, leading to more effective use of data in tackling key agriculture and nutrition challenges. - Weather data: catalysing business development and capacity development towards improved food security. - Land data: harmonisation of fragmented data while contextualizing to local conditions. - Nutrition data: data interoperability supporting the “nutrition data. Please register for the webinar at: https://attendee.gotowebinar.com/register/4685516408264591105. After registering, you will receive a confirmation email containing information about joining the webinar. 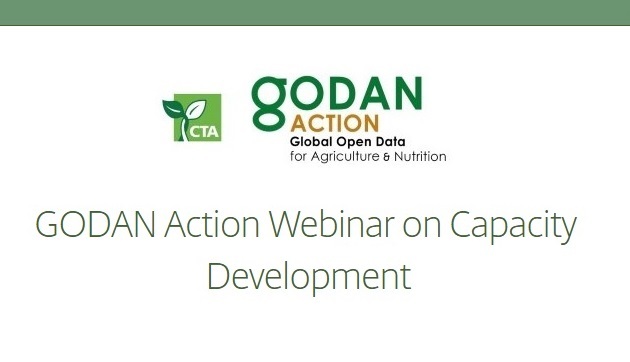 We look forward to welcoming you to the webinar and to GODAN capacity development. The recordings of our previous webinars are at https://www.youtube.com/playlist?list=PLv8yRTnf9h7j-5SoKRs6lEsdI1EyzM8Cc .